Bear is a quiet dog, but he commands your attention when he walks into the room. 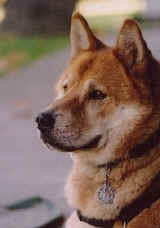 This 12-year-old Chow mix joined the group in April 2001. Bear was brought to Town and Country Veterinary Hospital by the Animal Welfare League of Warren. Sam fixed his leg and made him his own. This wonderful dog lives with Sam and Katie in Hubbard, and volunteers at St. Elizabeth's, Liberty Arms and Paws To Read at the Hubbard Public Library. Bear enjoys visiting with all the patients and the many treats he receives from them. When he's not volunteering, he enjoys going for long walks in the woods and playing with his best friend, Bob. Bear lives with 7 other dogs, 7 cats and a human sister, Anastiya. 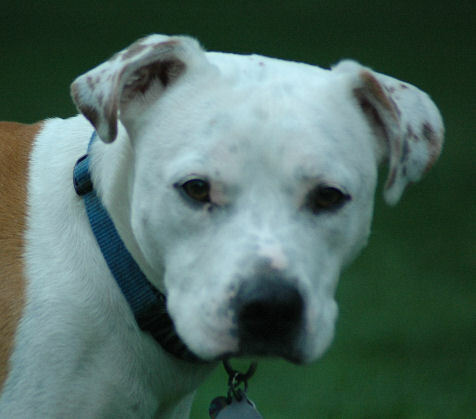 Handsome Bob is a 3-year-old Pit Bull, a great spokesdog for his breed. His mission is to show people that a problem dog isn't in the breed, but in the dog and owner. Bob lives in Hubbard with Katie and Sam, he joined K-9s in 2007. Bob visits at Liberty Arms, where he soaks up all the smiles and handsome comments. Bob's favorite pastime while at home is running around the backyard with his 7 brothers and sisters. He also lives with 7 cats and a human sister, Anastiya. Bogey is a large dog with an even larger heart. He loves everyone he meets and has a special love for children. With his striking red color and expressive face, this 9-year-old Bullmastiff attracts attention wherever he goes. 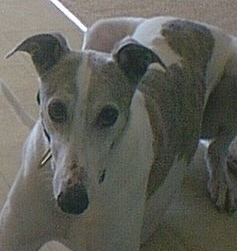 Bogey joined the group in the fall of 2002. He lives in Austintown with Lori and loves visiting at St. Elizabeth's, Humility House and Paws to Read at the Hubbard Public Library, where he is so popular that people who've never met him know him by name. "Oh, this must be Bogey," is the comment heard from many a staff member. Some days, he can barely get out of the lobby because of the crowd he attracts. His favorite part of visiting is having people make a fuss over him and getting belly rubs. When he's not visiting, he enjoys cuddling on the couch, going to dog shows and playing with his canine siblings, Foster, Kirby and Bailey. Bonita is an extra special Boxer mix. 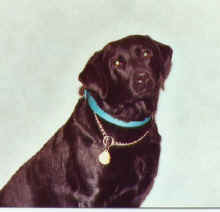 She is the very first K-9s For Compassion dog to be tested into the program in 2000. Bonita is 12- years young and lives with Sam, Katie, Anastiya, and 7 other dogs and 7 cats in Hubbard. Bonita had been retired for a few years but has just recently rejoined the volunteer force. Bonita will visit at Liberty Arms where she will enjoy getting her ears rubbed and putting smiles on the residents' faces. When she is at home, Bonita chills out on her couch. 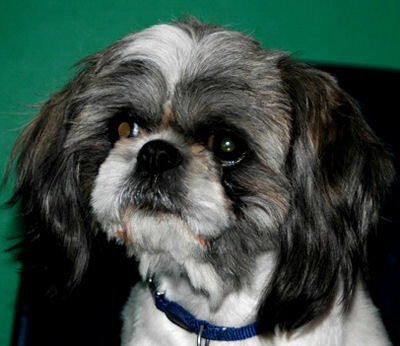 Cody is a snuggly 4-year-old ShiTzu who brings smiles to everyone he meets. He is a very empathetic little guy who can always tell when someone isn't feeling well. He will lay with them by the hour. Cody lives in Masury with Sharon and Suzanne. He loves to romp with his daughter, Lili, and his feline friend, Cat. Cody may be small, but he has a big heart. He likes to visit at Liberty Arms and St. Elizabeth's Hospital. Dakota's photo and bio coming soon! Dharma, a statuesque 7-year-old Boxer, and her mom, Barb live in Austintown. They have been bringing smiles to the faces of the residents and staff at Humility House since the summer of 2007. Dharma looks forward to the many hugs and treats she receives from the residents. When she is at home, she plays with her toys, watches TV and cuddles with Barb. Her favorite pastime is going for a ride. 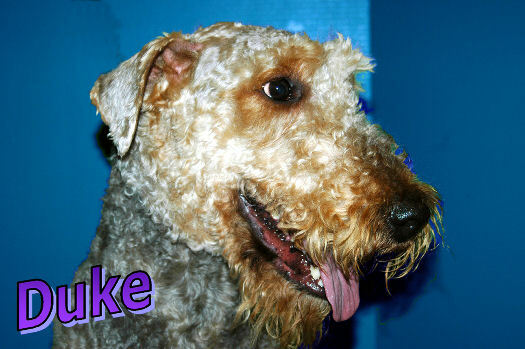 Duke is a happy-go-lucky Airedale Terrier who lives in Youngstown with his mom and dad, Mary Ann and Rod and his brother Louie. Duke joined K-9s in March of 2007. As Duke enters Humility House, Clare Bridge or MRDD, the residents there can't help but smile. He seems to have a permanently happy smile on his face as he visits from room to room collecting hugs and treats. When he's home, Duke plays with his doggie brother and his favorite toys. Elvis is a fun-loving 4-year-old Standard Poodle. He and his mom, Linda, joined K-9s in June 2007. When visiting, Elvis, "The King," loves all the attention he gets and being told how handsome he is. He would never turn down a good rub down and if you scratch his neck, he will follow you anywhere. When at home, he steals his sister, Georgie's toys and chases her around the yard. After all that excitement, he takes a nap on the lounge. Emily and her owner, Cheryl, of Canfield are a striking pair. With similarly colored manes, they turn heads everywhere they go. 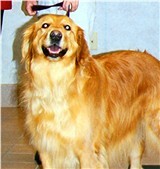 This 11-year-old Golden Retreiver joined the group in October 2000 and has since made St. Elizabeth's her home. She enjoys visiting various units throughout the hospital and especially loves doing bed visits. She seems to know that she has a job to perform and does it well. In her spare time, Emily likes to play with her collection of tennis balls, attack squeaky toys, run through the sprinkler, catch snow from the snowblower and prance around showing off her prized blue garbage can lid, which she mistakenly believes is a huge frisbee. 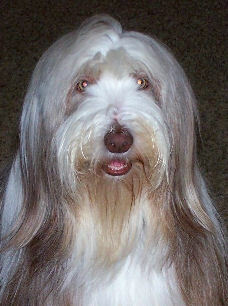 Linda's Bearded Collie, Georgie Girl is all personality. Georgie is a 6-year-old and joined K-9s in June of 2007. Georgie's beautiful, long flowing hair and happy face put smiles on many residents at Whispering Pines. Georgie loves walking in the door and hearing, "Georgie's here!" followed by pets and hugs. When at home, Georgie loves to play fetch and chase her brother, Elvis, around the yard and ride the golf cart. Hamish is an 8-year-old Borzoi, which is a coursing breed from Russia. He volunteers at St. Elizabeth's and Paws to Read at the Hubbard Library and attracts attention from staff and patients alike while he makes his rounds. Hamish joined the group with his owner, Megan, in October 2004. When he gets a bath and puts on his collar, he knows he is going to go visiting, and he trots across the bridge into the hospital with his head held high! 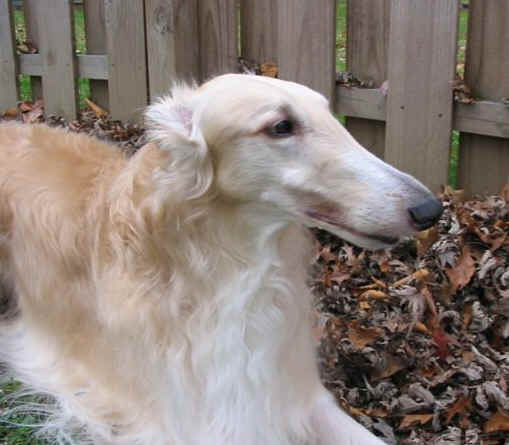 He enjoys ear and neck scratches and knows just when to give the special "borzoi lean" to those in need. He spends time sleeping on the couch, chasing backyard critters and playing with his little brother. His other hobbies include competing in the show ring and guarding his four cats. 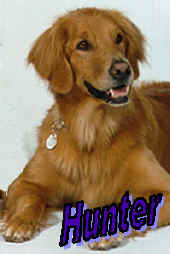 Hunter is an energetic 11-year-old Golden Retriever who is full of life. A charter member of the group, he lives with Nancy in Warren and volunteers at Community Skilled Health Care. He most enjoys all the hands-on attention he gets when volunteering. When he's at home, he likes to swim and romp in the woods. This 8-year-old Border Collie mix can bring a smile to the face of anyone. Keeper and his mom, Charlene from Hubbard, enjoy visiting weekly at Liberty Arms. They joined K-9's For Compassion in 2003 and have been a huge hit ever since. Keeper enjoys having his ears rubbed and back scratched while visiting. During his off time, he enjoys going for walks with grandpa and playing ball. This beautiful boy is just what the doctor ordered! Kiya is a 6-year-old American Staffordshire Terrier who lives in Warren with Dar, Brett and her doggie brother, Mo. Kiya joined K9s in 2005. Kiya loves being the center of attention when she visits at St. Joseph's Hospital, where the pediatric and psychiatric wards are Kiya's favotire part of visiting. She also soaks up the love she gets in the lobby and from the kids. Liberty, a beagle/dachshund mix rescued from a shelter in July 2005. She and her human friends, Tony and Mary Anne, joined K-9s in March of 2006. They live in West Middlesex with her doggy sister ValenTina. Liberty loves to see the smiling faces of those she visits at Liberty Arms and is especially happy when they thank he for coming to visit by showering her with hugs and kisses. A special treat for Liberty is being a part of the PAWS to READ program at the Hubbard Public Library which was started by Mary Anne in 2004. When she is at home, Liberty plays games with ValenTina. 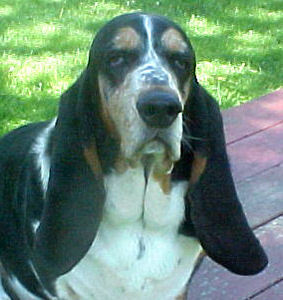 Lucy Sue is a sad-eyed, droopy eared, lovable 9-year-old Basset Hound. Lucy Sue and her "mommy", Cindy, joined K-9s in March of 2006. They bring smiles to the patients they visit at St. E's on the 5th and 8th floor, and at the School for Autism. Lucy's favorite thing about visiting is getting belly rubs and of course the many treats she receives from the nurses. When she is not working hard at the hospital, Lucy enjoys sunbathing in her backyard, taking walks and checking out the new smells along the way. Maddie is a 3 year old golden retriever. She has a lot of love for everyone she meets. Maddie lives with her parents, Becky and JD. She also has a feline sister whom she likes to try to play with. Maddie's hobbies include swimming in the lake, running through the woods, and playing with Monkey, her favorite stuffed animal. Maddie's favorite trick is to take trash to the trash can and throw it away. Maddie and Becky look forward to meeting people and lifting spirits. 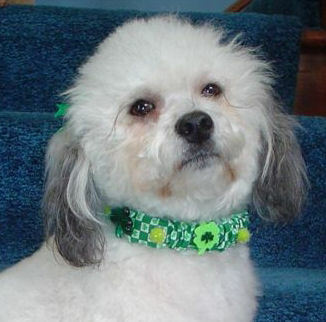 Meja is a 5-year-old Schnoodle (schnauzer/poodle mix) who lives with Nancy in Canfield. Meja joined K-9's in March 2006. She visits the residents at Humility House, Austinwoods and Park Vista and also brings smiles to the faces of the kids in the PAWS to READ program at the Hubbard Library. when Meja walks in the door, she attracts everybody's attention with cries and playful "growling." She loves to do her tricks and get her belly rubbed. When she is home, she plays with her buddy, Rudy, and runs around outside checking out all the new smells. Miles Davis is a sleek 8-year-old Greyhound who joined K-9s for Compassion in 2004. He lives with Melanie in Canfield. Miles visits Briarfield At The Ridge where he thrives on the loving he gets from residents there. He also takes part in the children's reading program at the Poland Library. When he's not visiting, Miles chills out on his couch. Mo loves people! And people are certainly curious about this 9-year-old American Staffordshire Terrier, who instantly wins their hearts with his charming ways. A member of the group since the fall of 2002, Mo visits at St. Joseph's pediatric and psyhiatric wards. His favorite parts of volunteering are meeting all the people in the lobby, who give him lots of pets, and getting attention from kis (his weakness). He likes going to work with his owners, Dar and Brett of Warren, and at home he enjoys chasing a ball and getting tormented by his younger sister, Kiya, who is also an American Staffordshire Terrier and also a member of K-9s For Compassion. 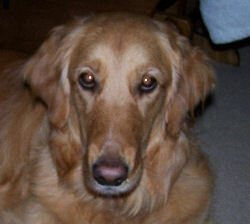 Mollie is a 10-year-old Golden Retriever whose sweet demeanor melts hearts everywhere she goes. A charter member of the group, she lives with Sue in Hubbard and visits at Park Vista Retirement Center and PAWS to READ at the Hubbard Library. All the individual attention, petting and treats the residents give her are what she likes best about visiting. Her favorite activities include running in the woods and curling up to sleep on just about any of the soft furniture in her house. Even though she's slowing down, she still gets excited when she sees the purple shirt and uniform come out of the closet. No one goes for a walk without taking Mollie. 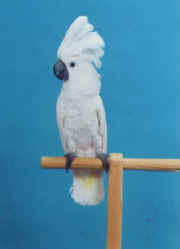 Ouija is an 18-year-old Umbrella Cockatoo who lives with his family, Nick and Nancy and Ellie of Girard. He is a delight to see as he talks to the residents at Liberty Arms and as many other facilities as the family can find time for. He occasionally will sing and dance, too. When he's at home, he likes playing with his toys, eating baby food, and going "bye-bye". Ouija's volunteer activity was featured on an episode of Animal Planet's "A Pet Story" in 2003. Ouija's fan club spreads far and wide! 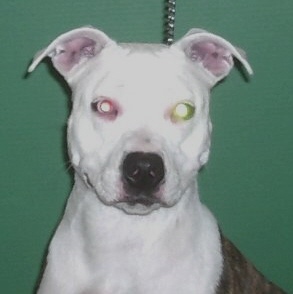 Little Peri Winkle, Peri for short, joined K-9s the spring of 2007. 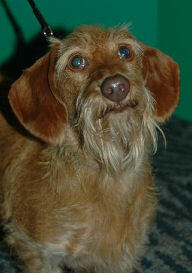 Peri is a 5-year-old Miniature Wirehaired Dachshund. She is short in stature but big in personality. Peri loves to interact with the residents at Humility House and the young folks at the Hubbard and Poland libraries. When she is at home in Boardman, she loves to take walks in Mill Creek Park and loaf on the deck. At the end of her busy day, she relaxes in the family room. 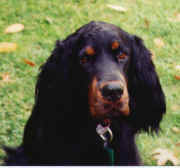 This gorgeous 7-year-old Gordon Setter is owned by Catherine of Youngstown and blesses St. Elizabeth's with frequent visits. She enjoys "discovering" everything she comes in contact with while visiting. While at home, she likes playing with her toys, practicing obedience and playing with her brother, Freedom. Poppy has been a member of K-9's For Compassion since 2003. 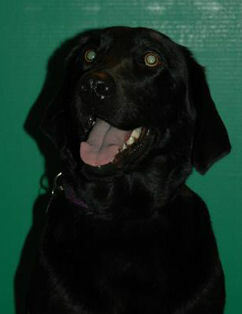 Reno Nevada or Reno for short is a happy 3-year-old black Lab. Reno, and her mom, Roxanne, live in Youngstown. They visit Humility House, Austinwoods and Hamptonwoods. Reno can sense how much her presence is appreciated; her whole body wiggles with joy when the residents reach out to her and smile. Rusty's photo and bio coming soon! Sam's photo and bio coming soon! 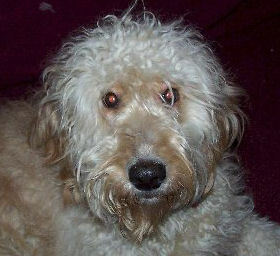 Stella is a 2 year old Goldendoodle who loves everyone she meets. Stella lives in Warren with Cherie, Zeus,(a Doberman), and human brother and sister William and Olivia. Stella enjoys spending time with her family, digging up the yard and carrying around at least two toys at once. She is very excited to be a new member of K9’s for Compassion and can’t wait to start visiting! 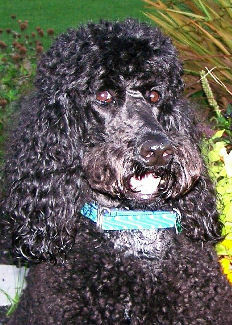 Victoria Rose is an 11-year-old black standard poodle who walks with a regal air and has a heart as big as they come. Blessed with an uncanny ability to sense when someone is distressed, Vickie nudges closer and closer until her head rests on the leg of one whose troubles will soon melt away with a pat on her sweet, soft, curly head. She volunteers at St. Elizabeth's and Paws to Read at the Hubbard Library. Vickie lives in Hubbard with Katie and Sam. Her favorite part of visiting is hearing, "You are soooo beautiful ... what a nice dog." When she's at home, she likes walking in the woods, lounging on the couch watching Animal Planet, romping with her 7 doggy sibligns, and playing with her red rocket. 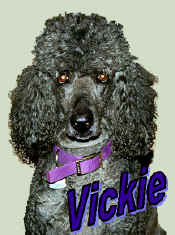 Vickie also lives with 7 cats and a human sister, Anastiya. 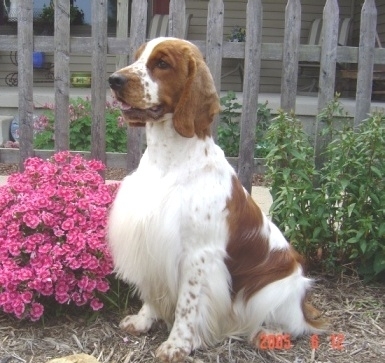 Walker is a 5-year-old Welsh Springer Spaniel. He is a finished champion in the show ring and is working on his obedience and agility titles. Now he is adding therapy animal to his list of accomplishments. He and his human friend, Cindy, joined K-9s in the fall of 2007. Walker loves the attention he receives at Cortland Nursing Home. At home, Walker plays Frisbee, chases squirrels and gives lots of hugs and kisses. Woody is an 11-year-old Black Labrador Retriever who lives with Mimi and Jim in Hubbard. He joined the group in the Spring of 2003 and visits at St. Elizabeth Hospital, Meadowbrook Manor Nursing Home, and schools and library programs. At St. E's he starts at the psych ward and then does any special requests he gets while in the elevator. He gets excited and heads right for the door when Mimi and Jim ask, "Do you want to go to work?" Woody loves to spread his love to all the patients and residents he meets especially the children. When he is at home, Woody likes to take naps, swim and run with his brother, Sam, and carry around his favorite stuffed toy. 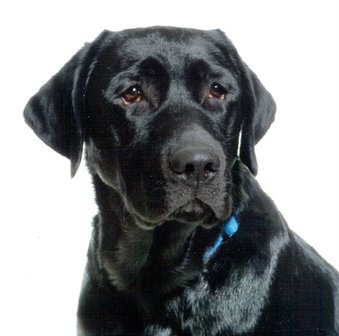 Yogi is an energetic 4-year-old Black Labrador Retreiver, who was a release from CCI - a group dedicated to training dogs for the handicapped. Yogi volunteers at Community Care, St. Joesph's and the PAWS to READ at the Hubbard Library. Yogi has very soulful eyes which are the windows to his heart. Yogi loves everybody and has been known to win over some of the most reluctant with his calm attitude and persistant stare. 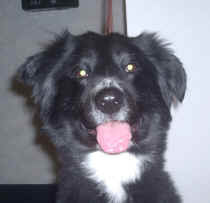 At home he enjoys running, romping, swimming and long walks with his friends.